"We do not know how long economic uncertainty and shareholder fear will last. Bear markets do not die of old age. The mispricing, however, is providing the opportunity to own high quality companies with terrific five year outlooks that imply high long-term IRRs.We are aggressively adding personal capital to the Funds and encourage our partners to do the same. Given that bullish sentiment is at its lowest level in 14 years and that some are recommending exiting equities altogether, there is plenty of panic in the air. Historically, the best time to invest has been when owning stocks has felt the worst. Throughout history a small number of successful investors have used periods of fear to build portfolio foundations for substantial long-term gain. John Marks Templeton was among the greatest.We pay tribute to Sir John who not only provided a rolemodel for investing, but also was a trusted advisor and supportive investment partner." 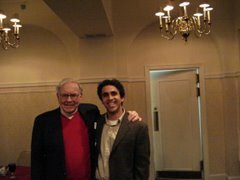 This is a gem article written by Buffett over 50 years ago. I remember in Omaha Buffett telling me that he found this business in the back of the famous "10,000 page Moody's manual" that he went through page by page. Like his approach to GEICO, Buffett's analysis is simple and hits on what counts. A big thanks to Dah Lau for sending this out. Again my favorite security is the equity stock of a young, rapidly growing and ably managed insurance company. Although Government Employees Insurance Co., my selection of 15 months ago, has had a price rise of more than 100%, it still appears very attractive as a vehicle for long-term capital growth.Rarely is an investor offered the opportunity to participate in the growth of two excellently managed and expanding insurance companies on the grossly undervalued basis which appears possible in the case of the Western Insurance Securities Company. The two operating subsidiaries, Western Casualty & Surety and Western Fire, wrote a premium volume of $26,009,929 in 1952 on consolidated admitted assets of S29,590,142. Now licensed in 38 states, their impressive growth record, both absolutely and relative to the industry, is summarized in Table I below.Western Insurance Securities owns 92% of Western Casualty and Surety, which in turn owns 99.95% of Western Fire Insurance. Other assets of Western Insurance Securities are minor, consisting of approximately $180,000 in net quick assets. The capitalization consists of 7,000 shares of $100 par 6% preferred, callable at $125; 35,000 shares of Class A preferred, callable at $60, which is entitled to a $2.50 regular dividend and participates further up to a maximum total of $4 per share; and 50,000 shares of common stock. The arrears on the Class A presently amount to $36.75.The management headed by Ray DuBoc is of the highest grade. Mr. DuBoc has ably steered the company since its inception in 1924 and has a reputation in the insurance industry of being a man of outstanding integrity and ability. The second tier of executives is also of top caliber. During the formative years of the company, senior charges were out of line with the earning power of the enterprise. The reader can clearly perceive why the same senior charges that caused such great difficulty when premium volume ranged about the $3,000,000 mark would cause little trouble upon the attainment of premium volume in excess of $26,000,000.Adjusting for only 25% of the increase in the unearned premium reserve, earnings of $1,367,063 in 1952, a very depressed year for auto insurers, were sufficient to cover total senior charges of $129,500 more than 10 times over, leaving earnings of $24.74 on each share of common stock.It is quite evident that the common stock has finally arrived, although investors do not appear to realize it since the stock is quoted at less than twice earnings and at a discount of approximately 55% from the December 31, 1952 book value of $86.26 per share. Table II indicates the postwar record of earnings and dramatically illustrates the benefits being realized by the common stock because of the expanded earnings base. The book value is calculated with allowance for a 25% equity in the unearned premium reserve and is after allowance for call price plus arrears on the preferreds.Since Western has achieved such an excellent record in increasing its industry share of premium volume, the reader may well wonder whether standards have been compromised. This is definitely not the case. During the past ten years Western's operating ratios have proved quite superior to the average multiple line company. The combined loss and expense ratios for the two Western companies as reported by the Alfred M. Best Co. on a case basis are compared in Table III with similar ratios for all stock fire and casualty companies. The careful reader will not overlook the possibility that Western's superior performance has been due to a concentration of writings in unusually profitable lines. Actually the reverse is true. Although represented in all major lines, Western is still primarily an automobile insurer with 60% of its volume derived from auto lines. Since automobile underwriting has proven generally unsatisfactory in the postwar period, and particularly so in the last three years, Western's experience was even more favorable relative to the industry than the tabular comparison would indicate.Western has always maintained ample loss reserves on unsettled claims. Underwriting results in the postwar period have shown Western to be over-reserved at the end of each year. Triennial examinations conducted by the insurance commissioners have confirmed these findings.Turning to their investment picture, we of course find a growth in invested assets and investment income paralleling the growth in premium volume. Consolidated net assets have risen from $5,154,367 in 1940 to their present level of $29,590,142. Western follows an extremely conservative investment policy, relying upon growth in premium volume for expansion in investment income. Of the year-end portfolio of $21,889,243, governments plus a list of well diversified high quality municipals total $20,141,246 or 92% and stocks only $1,747,997 or 8%. Net investment income of $474,472 in 1952 was equal to $6.14 per share of Western Insurance common after minority interest and assuming senior charges were covered entirely from investment income. The casualty insurance industry during the past several years has suffered staggering losses on automobile insurance lines. This trend was sharply reversed during late 1952. Substantial rate increases in 1951 and 1952 are being brought to bear on underwriting results with increasing force as policies are renewed at much higher premiums. Earnings within the casualty industry are expected to be on a very satisfactory basis in 1953 and 1954.Western, while operating very profitably during the entire trying period, may be expected to report increased earnings as a result of expanding premium volume, increased assets, and the higher rate structure. An earned premium volume of $30,000,000 may be conservatively expected by 1954. Normal earning power on this volume should average about $30.00 per share, with investment income contributing approximately $8.40 per share after deducting all senior charges from investment income.The patient investor in Western Insurance common can be reasonably assured of a tangible acknowledgement of his enormously strengthened equity position. It is well to bear in mind that the operating companies have expanded premium volume some 550% in the last 12 years. This has required an increase in surplus of 350% and consequently restricted the payment of dividends. Recent dividend increases by Western Casualty should pave the way for more prompt payment on arrearages. Any leveling off of premium volume will permit more liberal dividends while a continuation of the past rate of increase, which in my opinion is very unlikely, would of course make for much greater earnings. Operating in a stable industry with an excellent record of growth and profitability, I believe Western Insurance common to be an outstanding vehicle for substantial capital appreciation at its present price of about 40. The stock is traded over-the-counter.